I hope that many of you are able to celebrate a fun and relaxing Father’s Day with family and friends. We are hoping to have a family cookout here today: grilled chicken and KC Strip, corn on the cob, side salad, and Coke Cake for dessert. I am hopeful that Kansas weather will cooperate, as we have had enough rain to last us the rest of June! The only thing that might prevent this celebratory meal would be if Mom has to have surgery. It has been a twisted couple of days, that is for sure. She originally went into the hospital a little over a week ago because her hypertension (high blood pressure) and orthostatic hypotension (blood pressure bottoms out when standing up) were out of balance. They managed to tweak medications and regulate her blood pressure by Tuesday, but then on Wednesday she started to experience pain in her abdomen. A sonogram showed that it might be her gall bladder, but the surgeon was hesitant to operate on Friday because he was not completely convinced that was the culprit (and given her weak heart, unnecessary surgery is not an option). Anyway, we are in a holding pattern until they can discern the right direction to take. The books are probably of interest to only a select few and I do not want to bore you. I do not feel qualified to write an in-depth review on these topics, so instead I remain silent. My free time this summer seems to be quite limited (at least as long as Mom is in the hospital) and I would rather spend it reading new books, than writing ill-qualified reviews. Most of my books this summer have been of the non-fiction genre. I have read several books on photography – and now that my son bought me a new camera (Canon EOS Rebel T1i — thank you, Brian!!!) I am really itching to put this new-found knowledge to practical use. While I feel unqualified to write a review for these books, I will say that I truly enjoy Bryan Peterson’s writing style. I found his book on Understanding Exposure to be very informative and written in a way that an amateur could easily understand. You might recall that this is the same author who wrote Learning to See Creatively which I thoroughly enjoyed and plan to re-read again sometime soon. The third category of non-fiction books that I have focused my reading is Cookbooks. I have probably checked out of the library about 20 or 25 over the past few weeks. My first major haul included cookbooks of Food Network personalities, such as Rachael Ray, Paula Deen, Barefoot Contessa, and Yan Martin. However I quickly discerned that if I made these recipes all the time, I would probably gain about ten unwanted pounds. So the next batch of cookbooks focused on recipes that include low-fat substitution suggestions, like the Hungry Girl and Cook Yourself Thin. I must say that I had already incorporated several of these suggestions myself over the years, but each cookbook provided a couple of tasty sounding recipes that I would like to try. 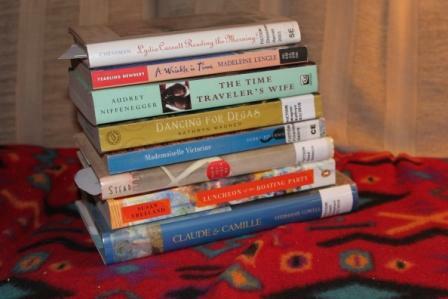 The fiction novels that I have chosen to read during this time period have been “research” for my book project. To the left is a picture of the novels that I have set aside; the ones that I have completed so far include: Dancing for Degas by Kathryn Wagner, Lydia Cassatt Reading the Morning Paper by Harriet Scott Chessman, and When You Reach Me by Rebecca Stead. In my “research” I am trying to read books that take place in the age of Impressionism (Paris, France around 1875-1882); that involve Time Travel — both adult and YA — as I believe my finished book will be most appropriate to the adolescent market. 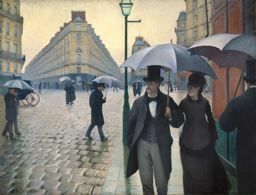 I must say that I am rather stumped as to why I feel driven to write a time travel book about the Impressionists. My interest in art has only been within the last couple of years – and I am certainly NO expert; and I have never had an interest in time travel books. But…I am trying very hard not to question the inspiration, but rather to follow and see where it leads me. This week will probably be focused on getting Mom out of the hospital – and arranging in-home care for her; researching activities for our upcoming trip to Chicago by way of St. Louis (I already know I want to visit the St. Louis Zoo and the Italian neighborhood of that same city as well as the Art Institute of Chicago and the Shedd Aquarium), and reading some of those novels pictured above (perhaps The Time Traveler’s Wife and Luncheon of the Boating Party would be good selections. You will enjoy the Art Institute in Chicago, one of my favorite places in the city. Emjoy your trip. My Sunday Salon. Molly, hope all goes well for your Mom and you can get her out of the hospital and settled in her home. Don't worry about the reviews. Everyone loves to come by and see what you've been up to. Reviews are nice, but not mandatory. Take care and enjoy your reading, whatever direction it takes you. Molly, I hope that your mom is feeling better soon, and that you still have time to do the things you enjoy this summer. A book – writing a book! How exciting and probably a tad scary. Best of luck and i hope you will share part of the process. The Art Institute of Chicago is magnificent, particularly summertime, with the lake right there and the sculpture garden wearing its best suit. Millenium Park is just a short walk north of the Art Institute. It is a fun and beautiful spot as well with places to eat. Behind the Shedd is one of the best views of the skyline. Can you tell I'm from around the Windy City? I just read Willa Cather's Lucy Gayheart, which is a short read, though sad. I mention it because much of the book is set in Chicago at the turn of the century right on Michigan Avenue and it might be fun to tour it first on Cather's pages, then on your own walking the same spots. It seems like you are more on a self-help, spiritual journey, and that is OK! No need to apologize for not doing book blogging. I keep thinking about how your plans changed for you this summer and you weren't able to go overseas, but in hindsight, things do happen for a reason don't they? You are here for your mom, which is so important! I don't think that book reviews make a book blog…posts like this are just as delicious! Good luck with writing your book and best wishes to your mom. Honestly, most of the books you mention are ones I'd love to hear about. So little non-fiction gets reviewed on blogs. I review everything I read because I figure there's probably someone out there who's interested in the topic no matter how obscure. And I like writing reviews. I hope Mom is well soon and that your barbecue is a big success. What is KC Strip? I don't think we have that in California. I hope all goes well with your mom! I haven't done a review in ages either. Partly because I haven't been reading that much and partly because I just couldn't find the right words or the time to talk about the book. I think talking about books, how they make us feel, etc., are great topics. I hope your mother does better soon. I add that (lol), because I don't cook much anymore and my kids would be laughing themselves silly at the thought. I have a book on my stack about writing by Jane Smiley, who has written some great books. I should read it…it's still sitting there, because it's pretty hefty. I'm with Amy – there's more to book blogs than reviews! Your mom is much more important than your blog, so I totally understand your focus on her. Don't feel bad about not keeping up on your blog 24/7. We all have times where we don't keep up as much as we would like. I hope your mom feels better and that you have fun on your trip! I hope your Mom is able to find out what's wrong and is quickly healed, Molly. Take care of yourself too, and don't think you've let us down – good gracious, I've barely been blogging this year, playing catch up with my life. At least you are reading, and some really interesting books at that! and you have a writing plan! I'm really happy for you. I thought you should know I've added Writing Down Your Soul to my TBR pile 😀 and I for one think your story sounds interesting! Don't worry about the reviews – I'm sure you'll get back to it when you have time and inclination! In the meantime, we all like to see what you're up to and what you're reading. Best wishes for your mom, I hope everything goes okay and she gets to go home soon. Hi Molly, I've been waiting for Understanding Exposure from the library hold list for months. I think I'm getting closer though. And I just ordered his other one, Learning to See Creatively. I just finished Writing Down the Bones. Great book. I'm like you…I research and research till the cows come home, but I think I have more fun doing the research than actually getting down to whatever it is that I'm researching! I always love the books you post about 🙂 I need to add Writing Down Your Soul to my to-buy list since my library doesn't have it. Oh and let me or Tif from Tif Talks Books know if you have any questions about St. Louis. Although we're not from here, both of us live here now; I've been here for 20 years. The St. Louis Zoo is wonderful…and free! I'm finding your journey through research to be so interesting! I'm cheering you on! Don't worry about lack of reviews. I have to admit that though I want to start reviewing children's books more, I feel like I'm not qualified to do so, so I've started to read non-fiction books about reviewing children's books to get better at it. Happy reading and have a great week. Real life trumps blogging every time, Molly. While I enjoy your book reviews tremendously, I am grateful that you chose to share some of your life today. Hope the BBQ went well, that your mom recovers quickly (and without surgery!!! ), and that you are able to celebrate your anniversary in Chicago in style. You deserve it! I agree with CB – I'd love to hear about the non-fiction books you are reading. That English Teacher in you is expecting a perfect book review but the rest of us are not. At least I hope that's not what you're looking for on my blog. In my opinion, the best book bloggers simply TALK about the books the read and their life experiences. Relax and enjoy your summer. If you feel like telling us about what you're reading we'll be hear to read it. Your mom is more important. Special prayers coming your way. Well, you shouldn't feel bad now … you covered a lot of books in this post! I think most everyone understands taking a break from blogging….we'll always still be here, so you should always feel free to focus on what's important: FAMILY!